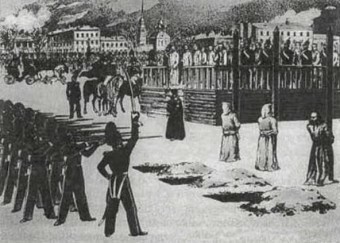 On December 22, 1849, members of a Russian intellectual literary group known as the Petrashevsky Circle were sent to Semyonov Square to meet their fate – death by firing squad. With the men pointing their rifles and fingers resting on the trigger, a messenger from the Tsar rode into the square waving a white flag. Like something out of a Hollywood movie, he declared he had an official pardon from the Tsar of Russia, Nicholas I, in a “show of mercy.” This was not a show of mercy, but rather a staged way of fostering fear, terror, and gratitude. This was a “mock execution” and among the victims was the famed Russian author of Crime & Punishment, Fyodor Dostoyevsky. So how did he get here? Fyodor Dostoyevsky was born in November 1821 to a working class Russian family. His father worked for a hospital catering to the poor and, while his family was better off than most, he saw first-hand the poverty and disillusionment of Russian society during the 19th century. When he was a child, Fyodor’s father would be promoted several times at the hospital, while coming into possession of lands and serfs. This exposure to Russia’s system of serfdom would greatly influence Dostoyevsky later in life. By the time he had turned 18, both of his parents had died; his mother from consumption (see: Why Tuberculosis was Called Consumption) and his father under more mysterious circumstances. While doctors said he died of a stroke, a neighbor swore up and down that he was murdered by his peasants, tied to a chair and drowned in vodka. News about a new genius, Mr. Dostoyevsky, is circulating across St. Petersburg. We do not know whether it is his real name or a pen-name. The reading audience is praising his new novel, Poor People. Even the great Russian critic Vissarion Belinsky praised the novel for being socially conscious and written with great skill. Taking Dostoyevsky under his wing, he introduced him to a number of Russian writers, poets, and artists. At least one Dostoyevsky biographer believed that this was not a good thing. Said Dmitry Grigorovich, “I can say with confidence that the success of Poor People, as well as the admiration of Belinsky, definitely had a negative influence on Dostoyevsky.” Grigorovich goes on to describe how Dostoyevsky became arrogant, insufferable, and too confident. Partially due to the negative attention, Dostoyevsky began to suffer from health issues. He fell into severe financial trouble, as well. This forced him to rely upon Belinsky and his group of socialist friends for help. On most Saturdays and Sundays, Dostoyevsky could be found at Mikhail Petrashevsky’s residence, who was an intellect and an advocate for utopian socialism. They would talk, eat, discuss the trying times, and denounce serfdom. This weekend group became known as the Petrashevsky Circle. According to the supreme order of the Tsar, I command you to arrest Junior-Lieutenant and literary artist Fyodor Dostoyevsky at four o’clock in the morning… to put a seal on all of his papers, manuscripts, and books, and dispatch instantly all these materials, together with Dostoyevsky to the Third Section of the Royal Police of His Majesty… if Dostoyevsky claims that certain documents belong to other people, ignore these statements and seal those documents as well. The group was incarcerated in St. Peter and Paul Fortress Prison, or simply known as “Fortress Prison,” where the worst criminals were kept. After months in prison, they were convicted of distributing letters with “abusive remarks about the Orthodox Church and Government” and conspiring to publish “anti-Government propaganda.” For this, they were sentenced to death by firing squad. There the sentence of death was read to all of us, we were told to kiss the cross, our swords were broken over our heads, and our last toilet was made. Then three were tied to the pillar for execution. I was the sixth. Three at a time were called out; consequently, I was in the second batch and no more than a minute was left me to live. As the squad pointed their guns at the three tied to the posts (as noted, not Dostoyevsky, who was off to the side), the shout went out, “Prepare to fire!” and, then, another sound rang out – that of a drummer who had been commanded to beat the “refuse,” meaning stop the previous order. The messenger had arrived with Tsar Nicholas’s I new order. “Long Live the Tsar” was yelled, blindfolds were taken off, and the prisoners, including Dostoyevsky, had tears in their eyes. They were saved, but this wasn’t a last second show of mercy. This pardon was actually agreed upon the day before, but with the orders that it was to be announced only at the last possible second. Mock executions have been a frequent torture technique meant to cause trauma, fear, and, at times, gratitude to those who “saved” them. They have even been used in modern times as well. A recent ABC report stated that ISIS used mock executions on American and Japanese hostages. In 1979, during the Iranian hostage crisis, those who worked at the American Embassy in Tehran were subjected to mock executions. The Chicago Tribune also reported that America’s CIA may have staged mock executions in hopes of getting alleged terrorists to talk in 2004. Despite this reprieve, the prisoners didn’t get off scot-free, far from it actually. Dostoyevsky, along with several of his fellow prisoners, were sent to work camps in Siberia, where they spent four years doing hard labor. When Dostoyevsky was released in 1854, he was still required to serve in the Siberia Regiment for a number of years. But he also went back to writing, most likely humbled. In 1854, he published The House of the Dead, a semi-autobiographical work about life in a Siberian prison camp. He continued to write and gain his literary creditability back. In 1864, Crime & Punishment was published, a novel about a young student plotting to kill a pawnbroker (someone who loaned others money) to take her riches and rid the world of “worthless vermin.” This was Dostoyevsky’s most famous work. And, of course, it wouldn’t have been written and you’d likely never have heard of him if the decision to pardon Fyodor Dostoyevsky hadn’t been made. It would seem he really didn’t waste the rest of his life. It should be mentioned that Dostoyevsky’s father’s neighbour had an ulterior motive for claiming that his serf’s had murdered him. Under Russian law at the time, if a landowner was murdered by his serfs, his land was passed to neighbours rather than inherited by his family.